"We cordially invite you to join us in celebrating the birthday of one of the most important filmmakers of all time, Sir Alfred Hitchcock." It's Hitchcock's birthday on August 13th (he would've been 114) and Mondo is celebrating by releasing three brand new prints for "a few of his most iconic films as well as some new apparel dedicated to the master of suspense." They've whipped up some fantastic art for Hitchcock's films Vertigo (1958), designed by Ghoulish Gary Pullin, and Psycho (1960), designed by Tomer Hanuka, along with a Hitch shirt. Mondo does Hitchcock? That's all we needed to hear. Check out the prints below. 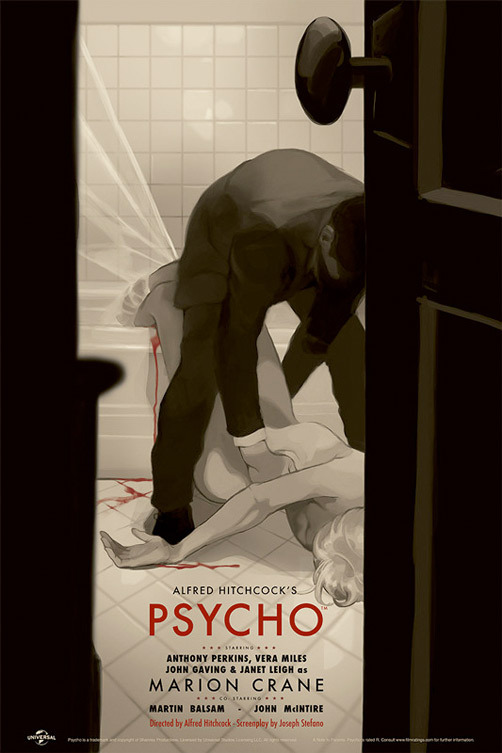 Psycho poster by Tomer Hanuka. 24"x36" screen print. Hand numbered. Edition of 290. $45. 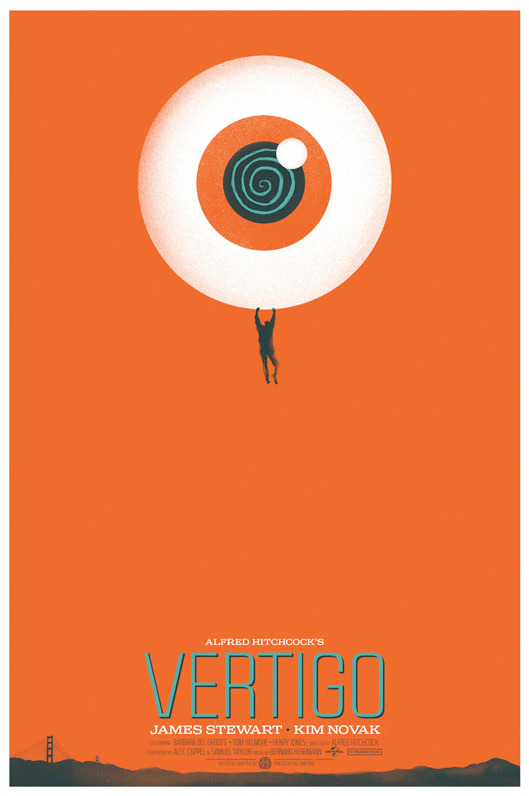 Vertigo poster by Ghoulish Gary Pullin. 24"x36" screen print. Hand numbered. Edition of 240. $40. 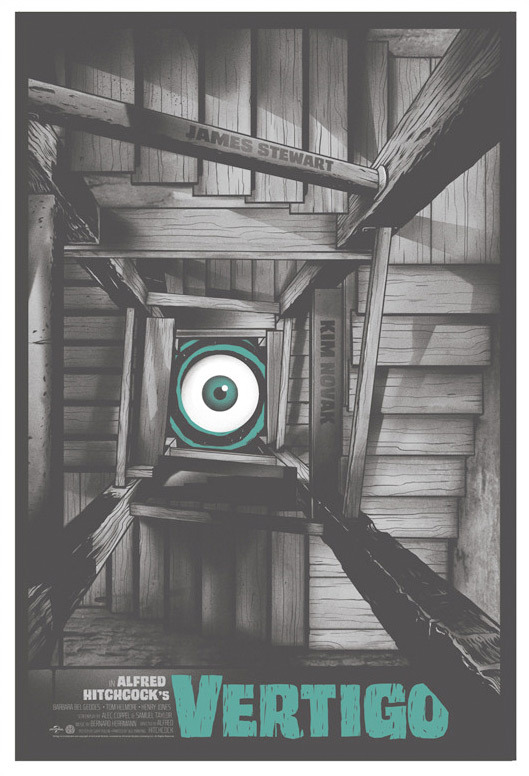 For more info on any of the prints, and to find out when exactly they go on sale, follow @MondoNews. In addition to these two prints, Mondo is selling a brand new t-shirt featuring the iconic caricature logo from 'Hitchcock Presents.' The black shirt features metallic silver/reflective ink. These posters and t-shirts will be available to purchase online at a random time on Tuesday, August 13th. Mondo continues to impress with stunning artwork that may seem a bit unconventional, but always has a subtle cinematic beauty that comes from an inherent passion for the films they're honoring. What are your thoughts on these latest creations?